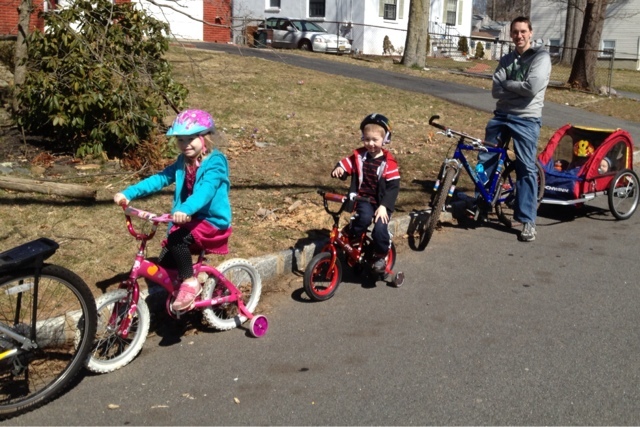 This weekend, we went for a family bike ride. Lily and Jacob did pretty well following along, sandwiched in between me and Ryan. Sam and Elliot shared the trailer behind Ryan's bike, which was super cute. We spent a lot of time stopping and reinforcing the rules of the road...because carefully riding your bike - with both the steering and the braking - AND staying on the side of the road AND going the same speed as the person in front of you were too many steps to remember all at once and needed lots of repeating. I think with more practice, they'll do a great job. At one point, the road angled downhill and Lily's bike was going too fast for her to control and her feet slipped off the pedals, which were still spinning without her so she couldn't get her feet back on them, and she ended up veering across the road and crashing into a neighbor's curb, falling sideways onto their lawn. She wasn't hurt, but as it was her first crash, she was pretty shaken up. We praised her for falling onto the grass instead of the asphalt (not sure how intentional that was, but still), and after walking her bike down the rest of the steeper part, she got back on and rode the rest of the way home. 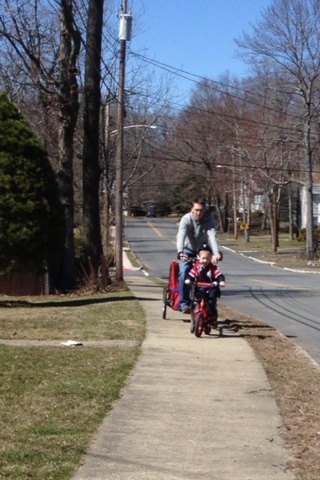 I'm looking forward to many more bike rides this Spring and Summer! It feels like forever since we've had a summer where I haven't been pregnant and have been able to participate in family activities like this with the kids.